Imagine you’re driving along in your car, nothing but the road in sight. Suddenly, you see a flash of black feathers on your windscreen, accompanied by a horrible thud. You pull over and see you’ve accidentally hit one of WA’s most beloved icons—a black cockatoo. 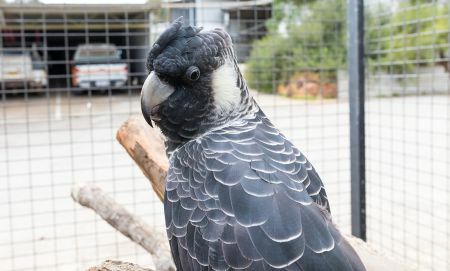 Kaarakin Black Cockatoo Conservation Centre is WA’s resident cockatoo carer. 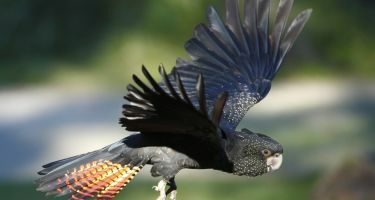 When they get a call about a sick or injured black cockatoo, they send out a cockatoo ambulance. 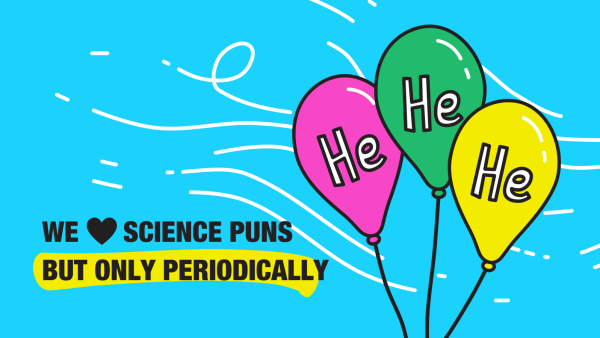 This isn’t your typical ‘nee-naw’ flashing lights affair. It’s the staff and volunteers of the centre who go out to pick up cockatoos. Members of the public can assist by keeping the bird secured until someone is available to pick it up. Something like a washing basket should be placed over it to keep it from flying away. If you’re able to place the bird into a box, taking it to the vet is another good first point of contact, as vets can stabilise the bird before calling Kaarakin. This makes the bird easier to pick up and transfer. Back at the centre, they’ll conduct an initial assessment before transferring the bird to Perth Zoo for treatment. 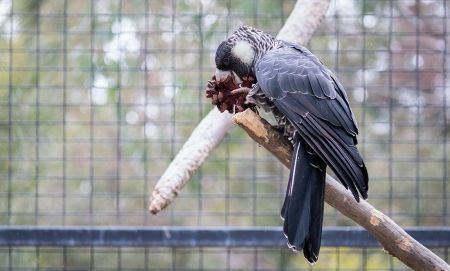 Perth Zoo treats all three species of black cockatoo in its vet clinic: the Baudin’s cockatoo, Carnaby’s cockatoo and red-tailed black cockatoo. The Carnaby’s cockatoo is listed as endangered and the other two species as vulnerable. Land clearing, illegal shooting, competition for nest hollows with non-native species and, of course, collisions with cars are some of the main threats to these birds. 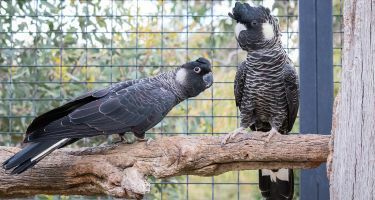 That’s why Perth Zoo works together with the Department of Biodiversity, Conservation and Attractions (previously the Department of Parks and Wildlife) to save these birds when sick or injured. When it first arrives at the zoo, the bird will be taken to a warm room where it can settle down. A vet will then conduct an examination to work out what the main issues are. If they can help, they can anaesthetise a bird to perform a detailed examination, surgery and other treatments. 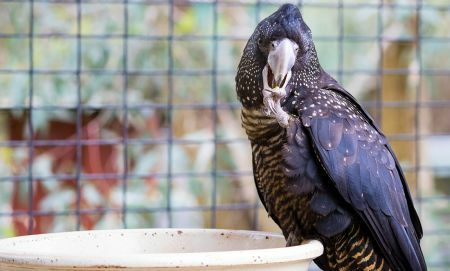 Once the bird’s on the mend, it can spend a few days to several weeks recovering at Perth Zoo. When the vet’s happy, they’ll give the bird a clean bill of health and a trip back to Kaarakin for rehabilitation. When it comes to rehabilitating birds, every case is different. Young birds may need to be formula fed for a while, some birds may need to put on weight and some birds may need to boost their fitness levels before they’re ready for release. Kaarakin uses a large flight aviary to get the birds fit and ready to fly. This low-stress environment is like a lap pool for cockatoos. They fly from end to end, building their strength and fitness. Young birds have a few extra things to learn before they can go out into the wild. Like how to smash through a gum nut, so they don’t go hungry. But how do you teach them? It’s a risky business for humans to get involved because the bird may imprint on them. A baby bird doesn’t know it’s a bird until it visually imprints on its parents. But if the bird is taken into human care before this happens, the bird might instead imprint on humans, thinking it’s one of us. Imprinting is irreversible, and human-imprinted birds will usually not survive release. Therefore, Kaarakin has to keep imprinted birds in the centre indefinitely—not the ideal scenario. You can prevent imprinting by limiting the birds’ contact with humans. But that means you can’t get someone to go in the cage to train the baby birds. Instead, Kaarakin pairs up young birds with older, more experienced birds. 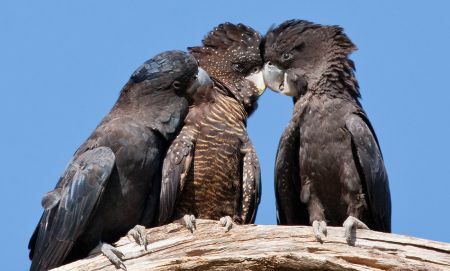 They are incredibly social animals, so the older one will usually take the juvenile under their wing and teach them the ways of the cockatoo world. Namely showing them good grub and how to eat it. While the birds are getting fighting fit, they’re also making friends. They form bonds in captivity, which they take with them out into the wild. This is called a ‘soft release flock’, and when the birds are able to be released, they are released with this flock. After all, everything’s easier when you do it with your mates. Sometimes the cockatoos even pair bond with another bird in their flock—which is like a bird’s version of finding ‘the one’. Cockatoos have the sort of love stories that put Disney to shame. Most species pair bond for life and form flocks with their offspring. That means Kaarakin occasionally has the pleasure of pair bonds coming back to visit with their new babies. But even if they don’t come back, we know where they go … for a little while. Hospitalisation, treatment and rehabilitation is just step one of saving a cockatoo. 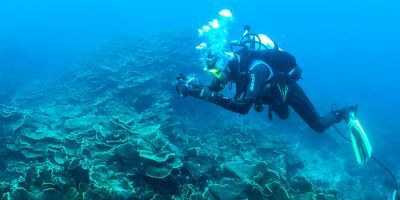 By watching what they do next, we can potentially save a whole species. 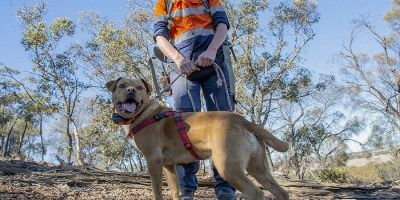 A collaborative study between Murdoch University, Perth Zoo and the DBCA has been tracking released cockatoos with GPS and satellite transmitters, which are attached to the birds’ back and tail feathers respectively. The transmitters are moulted out over time with the feathers. Watching where the birds go, the researchers can identify high-value habitats for conservation and help better inform management decisions for the species. They can also ensure the effort of saving the birds wasn’t all in vain. It’s good to know whether released birds are thriving and doing the right bird things: flying, feeding and breeding. Even when a bird sadly can’t be released, there are still ways it can help cockatoo conservation. It can join Kaarakin’s breed for release programme or its education programmes. There’s something a little bit special about WA’s beautiful black cockatoos. Their playful nature and raucous call have a place in the hearts of West Aussies. 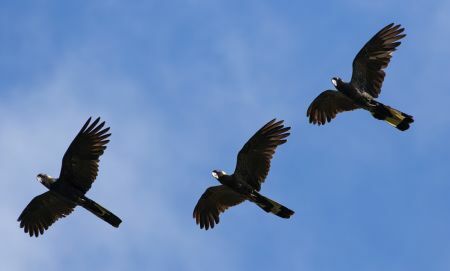 If you’d like to do your part towards saving these species, you can donate to Kaarakin, report sightings of black cockatoos to DBCA or join the Great Cocky Count 2018. Special thanks to Perth Zoo, Murdoch University and Celine Dubois for providing images and some of the footage used in this story.